Three apartments for 2, 3 or 4 people in a calm residence surrounded by a garden. 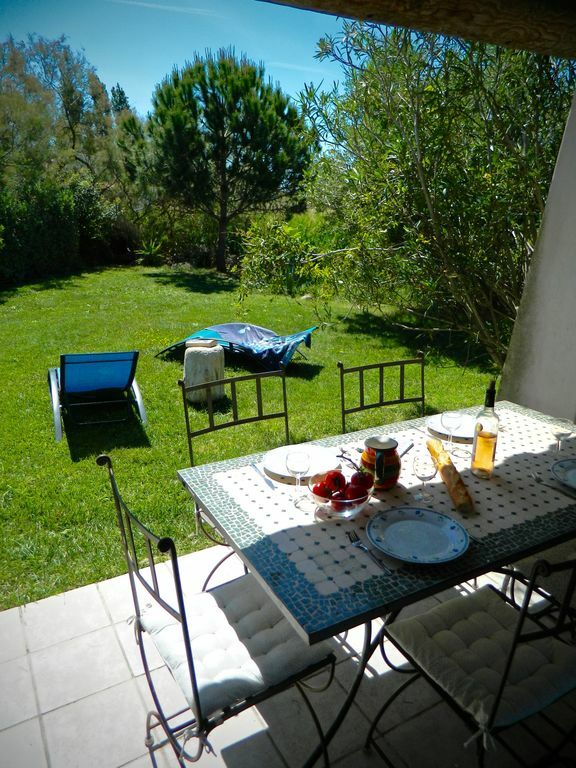 It is located, in the heart of wild Camargue, only 2.5 km away from Saintes Maries de la Mer and the huge sandy beaches. “Mas des Sagnes” welcomes you in one of the 5 terraced houses of around 50-m². The apartments are spacious and functional and three of them can host 4 people while the other two can host 6 people. The private terrace is open to the garden where nature is the priority. Wild ducks, coots, and water hens have chosen this place as their home and they will let you observe them. “Mas des Sagnes” is located in a very typical Camargue landscape. Two steps away from the house, you can go walking or jogging on the paths passing by the ponds and the “roubines” (small canals that cross Camargue) that are full of wild birds, and you can see the famous Camargue horses and the bulls grazing in the surrounding meadows. You are welcome to “Mas des Sagnes”. We welcome you and help you get comfortable in your residence. Since we live here as well, we are present and always available during your stay in order to help you choose among all the activities and plan your excursions in order to discover Camargue and the surrounding area. Our priority is nature as you can see from the garden that is full of wild ducks, coots, and water hens that will definitely come and ask you for some breadcrumbs. In spring, the swallows will build their nests at your door. For your comfort and well-being, our apartments are simple and functional and they provide all the necessary equipment for your stay. Equipment: dish washer, vitroceramic hot plates, oven, microwave oven, refrigerator with freezer compartment, electric coffee machine and kettle, toaster, crockery and cutlery, iron and ironing table, and a flat screen television (French TNT channels). Upon your arrival, you will find a welcoming basket with some cleaning and bath products for your initial needs. We can supply you with linen and the final housekeeping for an extra fee. We accept holiday vouchers. Cycling paths start from the house, horseback riding, and the Ornithological Park. The main room has a dining room with a table and 4 chairs. A high chair is available. You can rent bicycles in the village and have them delivered to the residence. Die Camargue-Unterkunft rund zwei Kilometer vom Ortskern von Saintes-Marie-de-la-Mer entfernt hielt, was sie versprach: Zweckmässig eingerichtete Zimmer und WC/Bad, gut ausgestattete Küche und angenehmer Aussenbereich mit Esstisch und Liegestühlen. Die Vermieterin war sehr aufmerksam und hilfsbereit. Wir können die Unterkunft mit gutem Gewissen an Personen empfehlen, die nicht die höchsten Qualitätsansprüche haben, aber Wert auf Sauberkeit, Zweckmässigkeit der Einrichtung, Vertrauenswürdigkeit und Ruhe legen. Auch möchten wir darauf hinweisen, dass Saintes-Marie-de-la-Mer mit dem Fahrrad innert weniger Minuten erreichbar ist. Et le endroit très calme impeccable. Das Anwesen ist ideal gelegen. Nur 2 km vom Dorf entfernt, schön ruhig und wunderschön inmitten von Teichen und Seen. Wir hatten zwei Terrassen und einen eigenen See direkt davor. Es war traumhaft idyllisch. Der Vermieter war sehr nett. Die Wohnung war einfach und zweckmäßig ausgestattet. Es hat uns an nichts gefehlt. Super waren die Moskitonetze an den Fenstern, die die Mücken gut abgewehrt haben. Uns hat es fantastisch im Mas de Sagnes gefallen. wir freuen uns, dass Sie Sich bei uns so wohl gefühlt haben . Herzlichen Dank für Ihre liebe Worte. Sie sind immer wieder gerne bei uns willkommen. Appartements avec coin jardin donnant directement sur un étang avec possibilité d'observer la faune. Idéal pour familles cherchant le calme, la proximité de la nature tout en ayant la possibilité de profiter des animations du chef-lieu en quelques minutes. Propriétaires très sympathiques, accueillants et disponibles si besoin d'un renseignement sur la région. Nous avons passé de très belles vacances et remercions encore une fois les proriétaires pour leur accueil et leur disponibilité. Par contre, nous attendons toujours le remboursement de la caution par Homelidays/Abritel (rien à voir avec le propriétaire) !!! Nous avons apprécié le calme, la situation géographique et la LITERIE;"
If you come from the north, take the departmental road 570 from Arles. If you come from the south: go from Montpellier towards Aigues Mortes and then, towards Saintes Maries de la Mer. Take the D38 until it reaches the D570 (do not turn before). Once you go towards Saintes Maries de la Mer (at around 4 km away from the village), you will find the Ornithological Park on your left. Then, keep driving for 1.5 km more. On your right, you will see a sign for “Chemin bas de Dromar” and several hotels (Tramontane, Mas de la Grenouillère, etc.). Turn right on this path. The “Mas des Sagnes” is the third building on your left. In the village: bicycle rental. Upon your request, we can take them directly to the house for you. Nous proposons aussi la location pour 2 personnes ainsi que WE et courts séjours, notamment en basse saison. Nous consulter. Possibilité location draps 10 €/personne/change, serviettes de toilette 7 €/personne/change et ménage final si non effectué par vous-mêmes 40 €. Caution 400 € 2 autres logements 4 pièces 5-6 pers. (3 chambres) et 3 pièces 2- sont également disponibles.